No one says you cannot add other ingredients to the yogurt to make it more tasty if you add the curcumin before fermenting the buttermilk. 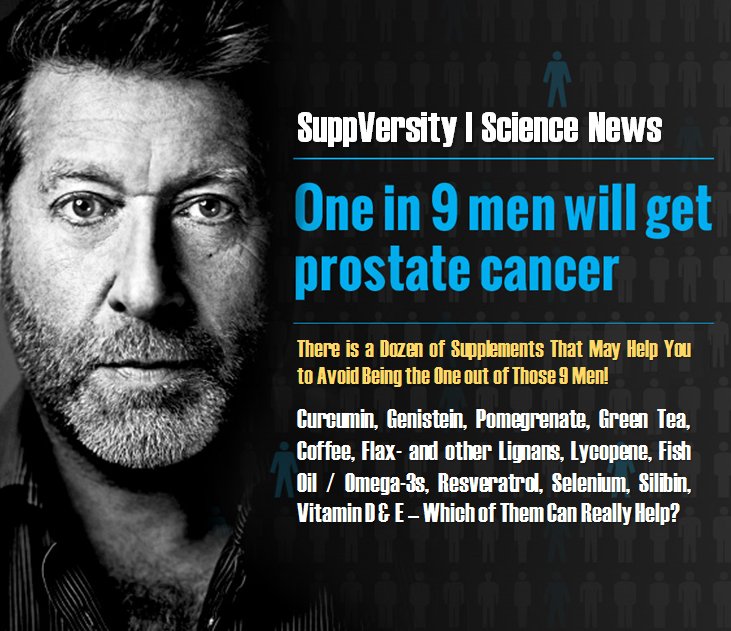 If you're a regular at the SuppVersity you will know that curcuminoids, the polyphenols found in turmeric roots (Curcuma longa), have health effects that are similar, in some cases even superior to several anti-inflammatory, anti-diabetic and lipid-lowering drugs. Yes, their consumption has even been linked to significant reductions in cancer risk. Unfortunately, there's a problem with these powerful polyphenols: they are hydrophopbic (Tønnesen. 2002) and prone to degradation in an aqueous environment at neutral and alkaline pH (Tønnesen. 1985; Wang. 1997) - two properties of which Gupta and others (2013) believe that they are responsible their poor oral bioavailability. 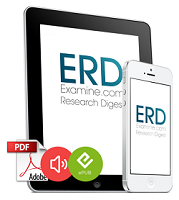 Is Vitamin E Good for the Sedentary Slob, Only? Vitamin C and Glucose Management? Low bioavailability or not, Shishan Fu and rightly highlight in the introduction of their latest paper, even the hardly absorbed "regular" curcuminoids have been reported to offer many health-promoting properties (Gupta and others 2013), it is thus only logical that there's an "interest in the development of functional foods containing these compounds is increasing" (Fu. 2016). Figure 1: Even dispersing them in buttermilk will increase the bioavailability by decreasing the breakdown of curcuminoids during digestion - that's at least what a 2014 study by Fu et al. shows. "[...t]he bioavailability may also be increased when formulated in appropriate delivery systems. For example, lecithin–piperine formulations containing curcuminoids and curcuminoids encapsulated in cellulose have been reported to have enhanced bioavailability after oral administration in humans (Antony and others 2008; Vitaglione and others 2012)" (Fu. 2014). Figure 2: Preparation of yogurts (Fu. 2016). An ABT-5 culture was prepared by mixing 0.2 g of culture granules in 10 mL of buttermilk dispersion (14% total solids, w/w) and stirring for 15 min in an ice bath. This culture solution was prepared freshly prior to fermentation. 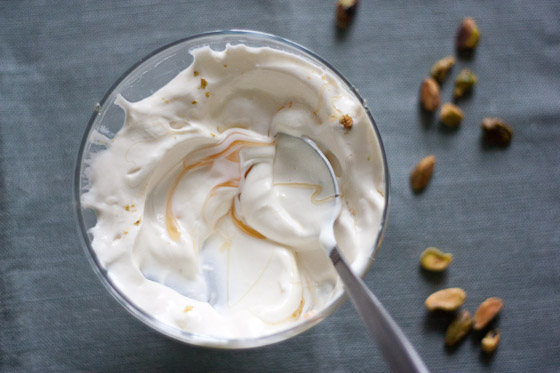 The ABT-5 culture was added at a level of 0.2 g/L of yogurt buttermilk. The buttermilk was subsampled (50 mL) into separate plastic containers and incubated at 43 °C until pH reached 4.6. These set yogurts were put into the ice water bath for 30 min, stirred at 200 rpm for 20 s using a mixer (Heidolph RZR 2050, Germany) and then stirred manually (approximately 20 times) to obtain a uniform product. The stirred yogurts were stored in a cool room (4 °C) overnight. 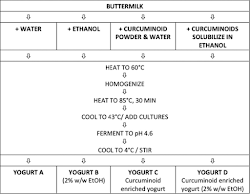 All analysis was completed within 2 d of yogurt manufacture. The total solids of the yogurts were estimated using a moisture analyser (Sartorius AG, Germany)." (Fu. 2016). To be able to tightly control the experiment, the curcumin enhanced yogurt and the other samples were exposed to in vitro digestion. During this procedure, the sample (5 g) was mixed with 15 mL of simulated gastric fluid (SGF) containing 2 g NaCl and 7 mL 37% w/v HCl per liter (pH 1.23) and 3.2 mg/mL pepsin, and incubated in a water bath with 100 rpm at 37 °C for 2 h (United States Pharmacopeia Convention 2009). "After exposure to SGF, the mixture was adjusted to pH 6.5 using 1 M NaOH and mixed with 9.6 mL of simulated intestinal fluid (SIF) containing 3 mL of 2 M NaCl, 0.3 mL of 0.075 M CaCl2, and 6.3 mL of 36.5 mg/mL bile extract in 5 mM phosphate buffer. The pH was adjusted to 6.8 and then 5.4 mL of 10 mg/mL pancreatin in phosphate buffered saline was added. Samples were incubated at 37 °C, 100 rpm for 3 h and then placed in an ice bath to arrest the enzyme activity. At the end of the in vitro digestion period curcuminoids were extracted from the whole digested mixture with acetone and quantified using HPLC-DAD" (Fu. 2016). The in-vitro digestion, which is described in a previous paper by Fu et al. (2015), provided the scientists with an estimate of the amount of undegraded curcuminoids - it is yet not a 100% reliable method to determine the real world biological effects in humans, which would have to be tested in future studies. In view of the fact that the scientists calculations show that the resistance of the curcuminoids to degradation after sequential exposure to SGF and SIF improved more than just statistically significantly (see Figure 3), it is logical to assume that benefits would be observed in vivo, too. Figure 3: Bioaccessibility of curcuminoids after sequential exposure of samples to SGF and SIF (Fu. 2016). The difference pre-processing, i.e. 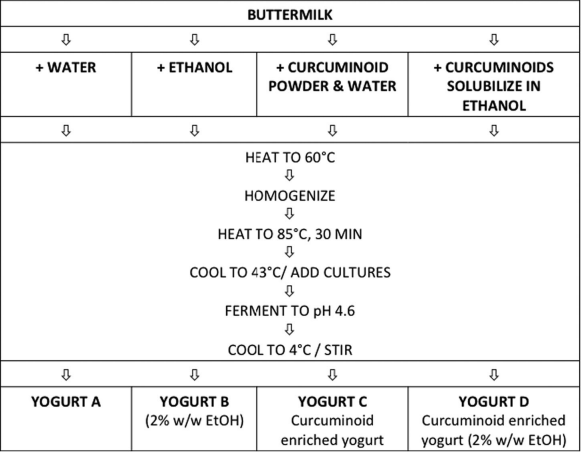 the prior dissolution in ethanol (which wouldn't make you drunk, anyway, because the total ethanol content of the yogurt would be marginal), the dissolution of curcuminoids in buttermilk and its fermentation to "curcumin enhanced" buttermilk yogurt with a standard ATB yogurt starter culture, made in terms of the bioavailability is after all huge. In fact, the bioavailability of the curcuminoids increased to an extent that easily surpasses the hyped "super / bio curcumins" that use a combination of curcumin and bioperin, which has been shown to exhibit a 6.93-fold higher bioavailability. In all fairness, we shouldn't forget, though, that, unlike the yogurt trick described here, Biocurcumax™ has already been studies in humans (Antony. 2008). The total bioavailability is still low, but... As, Fu et al. point out in the conclusion of their soon-to-be-published paper, "[t]he most important and practical finding from the bioaccessibility data is that the incorporation of powdered curcuminoids into buttermilk prior to yogurt manufacture results in a 15-fold increase in bioaccessibility of curcuminoids compared to that of neat curcuminoids dispersed in aqueous buffer" (Fu. 2016). The scientists are yet also right to point out that even with the enhanced bioaccessibility of curcuminoids the total bioavailability was still low (approximately 6%) when they were delivered in yogurt. In view of the fact that the polyphenols which are transferred into the colon are degraded by gut microflora and the degradation products contribute to the bioactivity of these compounds in the body, the real-world relevance of this astonishing increase in bioavailability will have to be tested in in vivo, before we can have a final say on the practical significance of these findings | Comment! Ahmed, Kashif, et al. "Nanoemulsion-and emulsion-based delivery systems for curcumin: encapsulation and release properties." Food Chemistry 132.2 (2012): 799-807. Antony, B., et al. "A pilot cross-over study to evaluate human oral bioavailability of BCM-95® CG (Biocurcumax™), a novel bioenhanced preparation of curcumin." Indian journal of pharmaceutical sciences 70.4 (2008): 445. Chuah, Ai Mey, et al. "Enhanced bioavailability and bioefficacy of an amorphous solid dispersion of curcumin." Food chemistry 156 (2014): 227-233. Fu, Shishan, et al. "Bioaccessibility of curcuminoids in buttermilk in simulated gastrointestinal digestion models." Food chemistry 179 (2015): 52-59. Yazdi, S. Rahimi, and M. Corredig. "Heating of milk alters the binding of curcumin to casein micelles. A fluorescence spectroscopy study." Food Chemistry 132.3 (2012): 1143-1149. Yu, Hailong, and Qingrong Huang. "Enhanced in vitro anti-cancer activity of curcumin encapsulated in hydrophobically modified starch." Food Chemistry 119.2 (2010): 669-674. Yu, Hailong, and Qingrong Huang. "Improving the oral bioavailability of curcumin using novel organogel-based nanoemulsions." Journal of agricultural and food chemistry 60.21 (2012): 5373-5379.